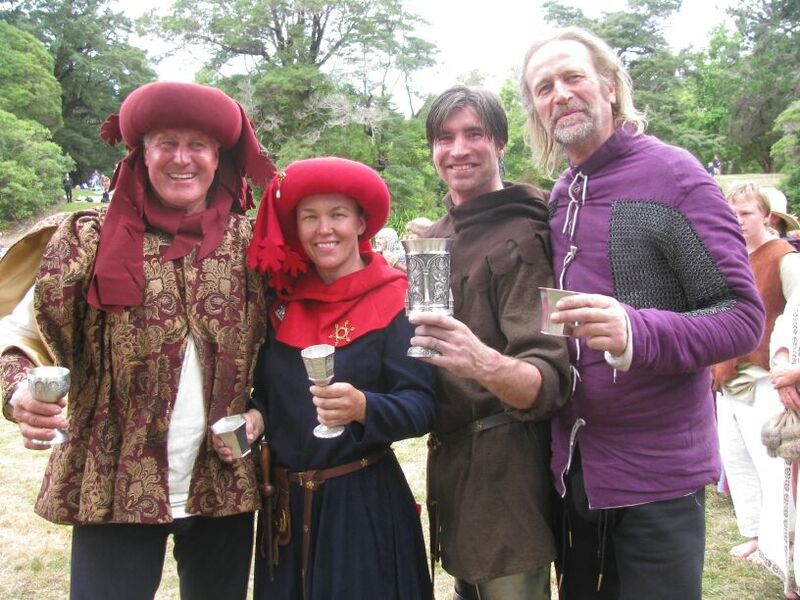 This past weekend, February 16 - 17, Dale Gienow of Canada won the prestigious Grail of Chivalry at the “Harcourt Park 2013 World Invitational Jousting Tournament” in Upper Hutt, New Zealand. 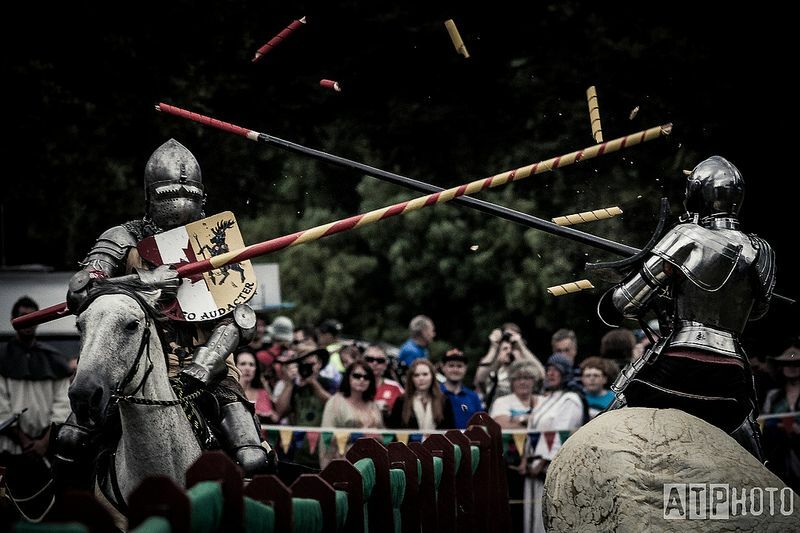 The Grail of Chivalry is awarded to the competitor who does the best overall in three competitions of jousting skill – mounted skill at arms (MSA), mounted melee and the tilt (which is what most people think of when they think of jousting). It was an especially impressive feat since Dale had to overcome several obstacles just getting to the tournament. “Rough start getting to New Zealand... was supposed to get there on Monday to train with the other international joust competitors, but a wicked Toronto snowstorm made it impossible to travel. Managed a flight at the 11th hour and made it on Friday – the day before the tournament. Unfortunately, the airline lost my armour and it didn't actually arrive (thank-you Helen!) until 1 hour before I was set to joust. Though I had no time to train in armour, "Buck" helped to carry me through the event (thank-you John [John King, one of the other competitors], for a great horse). My win was that much sweeter for all the aggravation prior. 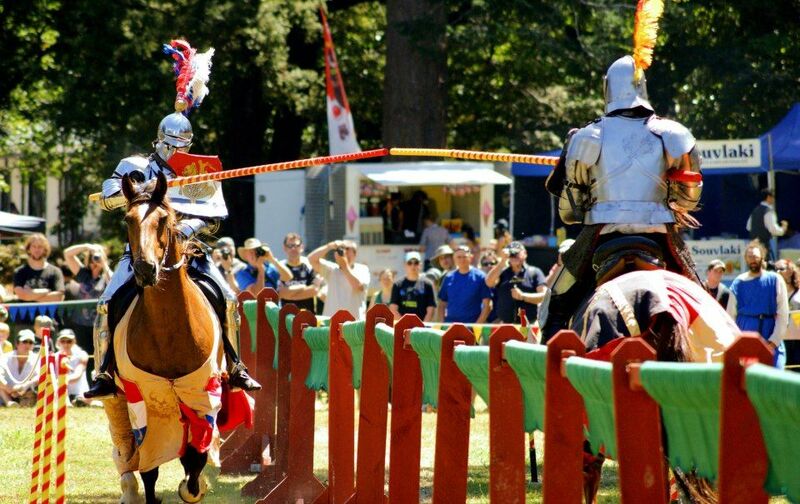 Although Dale won the overall competition, he did not actually win the tilt, the portion of the tournament that most people think of as the actual jousting. That was won by Australian jouster Sarah Hay riding another of John King's horses named “Nugget”. 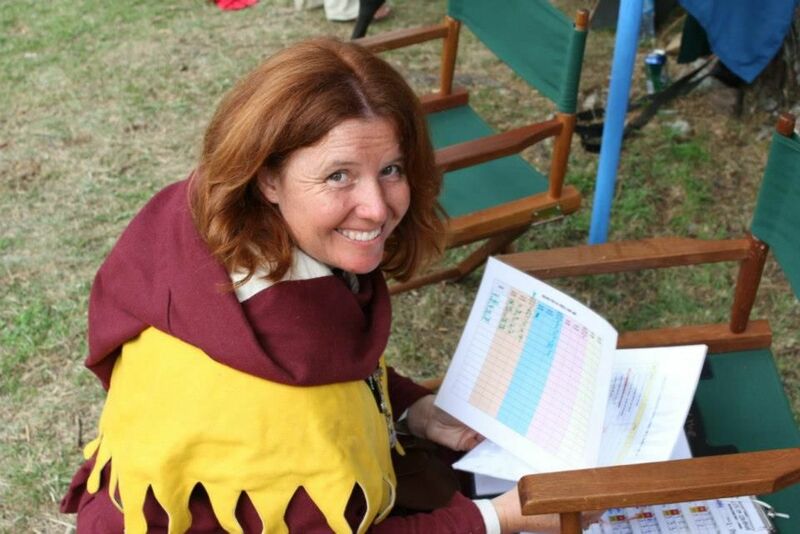 Sarah is the current Australian Jousting Champion and is probably the best female competitive jouster in the world. Sarah is certainly one of the most active women in the world of competitive jousting having competed successfully not only in her home country of Australia and its neighbor New Zealand, but also in Belgium, France, Poland, Denmark and the USA. She has actually won international jousting competitions in both the northern and southern hemispheres. Sarah placed second in the overall Harcourt Park 2013 tournament, barely missing first place because of being eliminated early on in the mounted melee portion of the tournament. “Harcourt Park is a very special event, and it was a privilege for me to ride there again. Callum Forbes runs a highly organised, professional event, and the setting, Harcourt Park, is absolutely magnificent. The riders this year were a really cohesive group who were generous with their praise to anyone who rode well. My thanks to all the competitors whose positivity, sense of fun and adventure and skill in the lysts made Harcourt Park so memorable. My personal thanks goes to John King for providing my wonderful steed for the weekend ‘Nugget’. 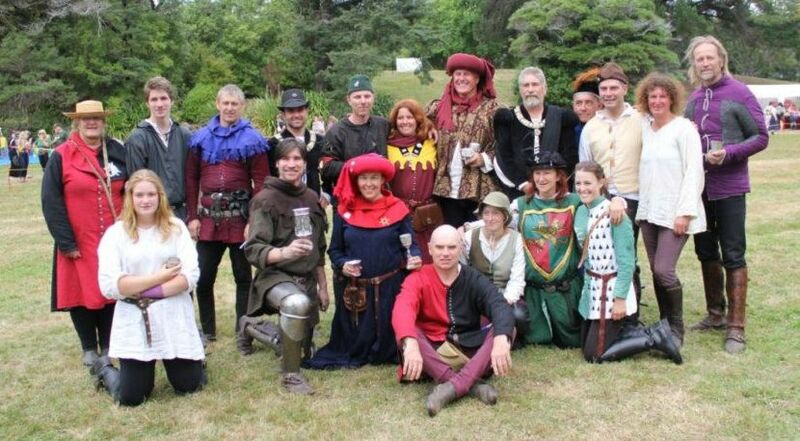 I’d also like to recognise the ground crew and squires who are absolutely essential to a smoothly run jousting tournament, especially Rosemary and Tony for all the help they gave me in preparing Nugget for each ride and helping me armour up. This year Swedish jouster Anders Fernstedt made his third appearance at Harcourt Park and placed third overall. Anders rode tournament organizer Callum Forbes' personal jousting horse Monty. Anders began riding with the Swedish Royal Cavalry in 1980. He later became involved with the jousting troupe Celeres Nordica and has been jousting internationally since 2005. Finishing in fourth place was the popular Belgian jouster Frederic Piraux who rode another of Callum Forbes' horses, PJ. Frederic created the “International Jousting League” probably the largest organization of competitive jousters in the world. 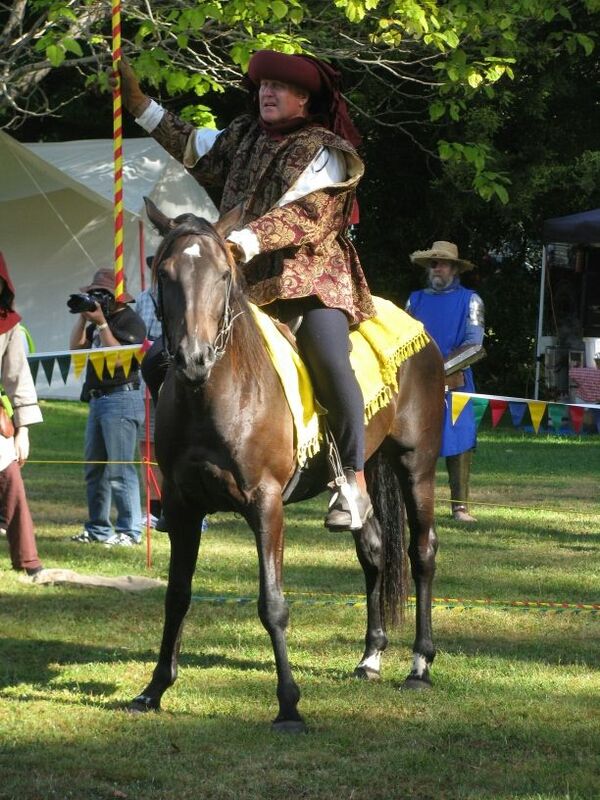 He was also the winner of the previous “Harcourt Park World Invitational Jousting Tournament” which was held in 2011. 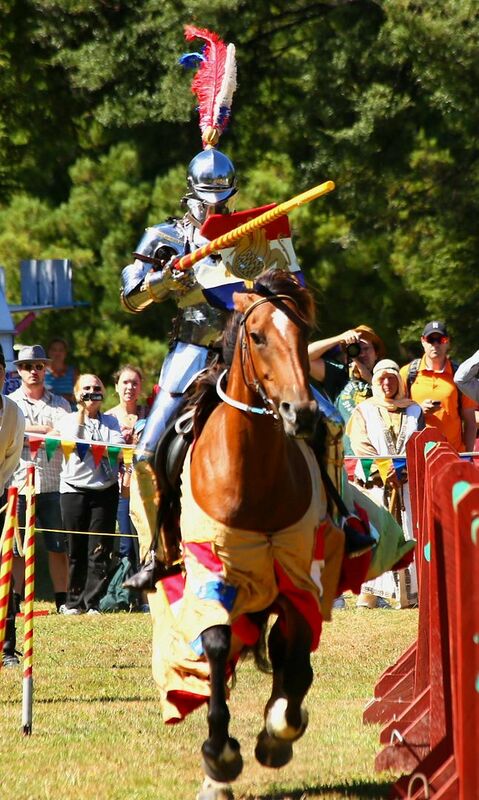 Sadly, this will be Fred's last year of competitive jousting. He is planning to retire after competing one last time in all of his favorite tournaments. 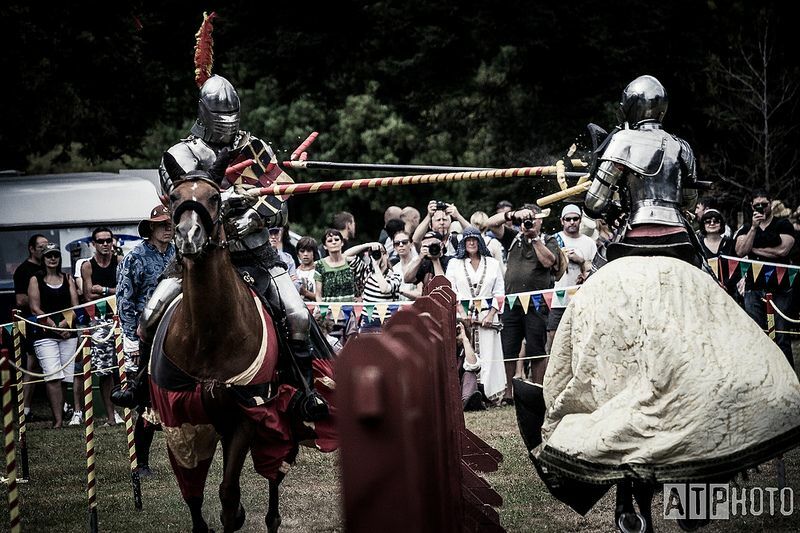 In addition to the Grail of Chivalry competition for experienced jousters, there was also an inaugural competition for the Chalice of Courage – a competition for less experienced jousters. New Zealander John King won first place by virtue of being the only novice jouster capable of completing the entire competition. This was not as easy as it might sound since he ended up tilting against more experienced jousters who took the place of the withdrawn novices in order to allow the competition to continue. John rode his horse Cabby on the first day of competition and his main horse Buck on the second day. John also managed to win the mounted skill-at-arms (MSA) competition. And ended the mounted melee in an exciting three way fight to the finish with Dale Gienow and Anders Fernstedt, managing to defeat both of the more experienced jousters. 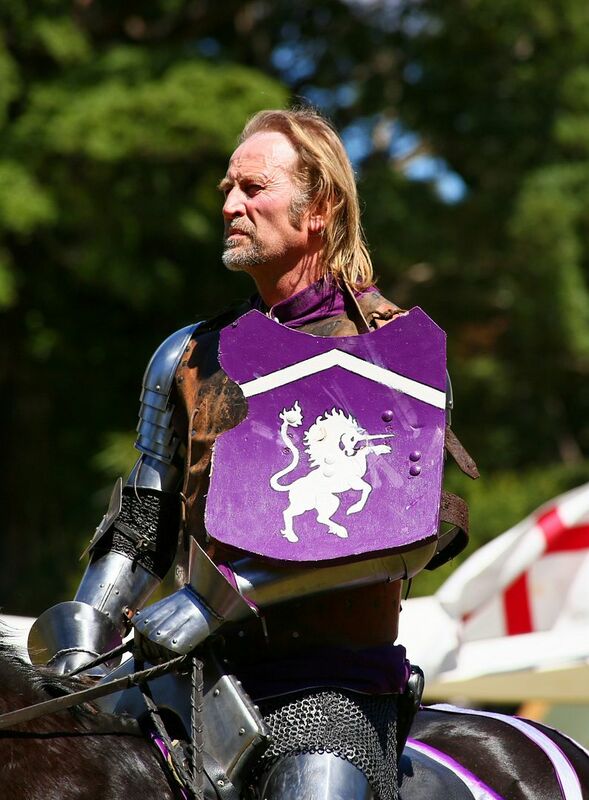 Fortunately, Rod Walker, famous from the “Full Metal Jousting” tv show, was not injured when fellow Australian jouster Andrew McKinnon managed to break his lance against Rod's helm during one of their matches on the first day of jousting. Unfortunately, Rod hit his knee against the tilt during the first day of jousting and injured it again during the mounted melee on the morning of the second day of the tourney. After the second injury, he chose to withdraw from the competition. Rod was actually in the lead at the end of the 1st day, so it was not an easy decision to make. A surprising thing about this tournament was the number of tip to tip lance hits. These kind of hits are usually extremely rare, but there were four of them during this tournament. A photographer managed to capture a picture an instant before Sarah Hay and Frederic Piraux smashed their tips together. Although the tournament organizer, Callum Forbes of “The Order of the Boar”, was trying out a new style of frangible lance tip[more about that in a future article], it is unlikely that the new tips had anything to do with the increase in tip to tip hits. In addition to the jousting tournament, the Harcourt Park event also included a Battle of the Nations(BotN) style ground combat display and competition, an archery display and competition and various living history displays. You can find out more about Callum Forbes and “The Order of the Boar” on their website. 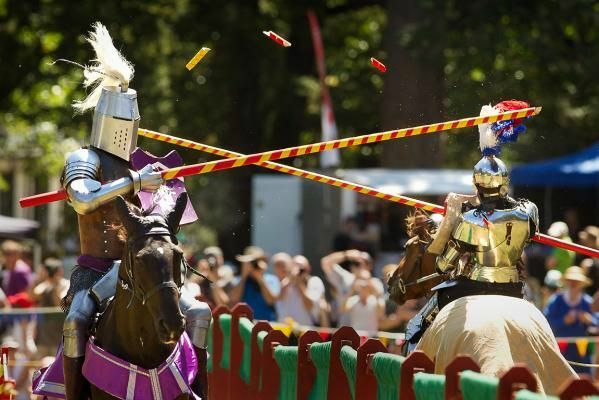 They are planning for the next “Harcourt Park World Invitational Jousting Tournament” to take place in the year 2015. Many of the jousters and ground crew responsible for putting on the tournament. No other places were given for the Chalice of Courage as none of the other novice competitors managed to complete the competition. *Although these pictures came from Rod Walker's camera, he was usually not the one taking the pictures. He simply handed the camera to whomever was available to take pictures, thus it is impossible to know exactly who took which pictures.